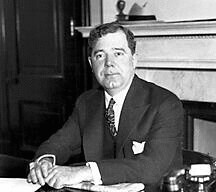 As the Top of the World Turns: Huey P. Long -- Dexter, Sinister, Scoundrel, Statesman? Huey P. Long -- Dexter, Sinister, Scoundrel, Statesman? The Corner at National Review Online is wracked (well, faintly ruffled) by a debate as to whether the late Louisiana Governor and Senator Huey P. Long was a righty or a lefty. Aside from the poor fit of a French revolutionary metaphor to the flowery variety of American policos, Long was unquestionably a lefty of a peculiar sort, a Louisanan Hugo Chavez. He excoriated the rich, and gave the rural folks paved roads, free textbooks, and a sense they mattered in Baton Rouge because Huey was one of them and would fight the good fight for them. He even managed to help the blacks, by giving them something approaching their fair share of state largesse. Long threatened to oppose the patrician Franklin D. Roosevelt, and would have done so but for an assassin's bullet. So he became tarred with an imaginary fascist brush, a tarring that seemed to be confirmed when brilliant disciple Gerald L. K. Smith descended into political irrelevance and eventually loony anti-Semitism. Long was a genius, an egotist, an authoritarian, a statesman and a villain, all at once. He has been too long forgotten, for he was a true American original. And then there was his bro, Earl, another successful politician whose very madness was problematical and immortalized by A.J. Liebling in The Earl of Louisiana. A fine book, but not quite as great as Penn Warren's novel All the King's Men, a roman à clef based on Huey's life and death, later a fine film. Russell, Huey's boy, was a model of probity in the U.S. Senate, perhaps to live down comparison with his more flamboyant relatives. More interesting than the Kennedys and the Bushes combined, this political family has been too long forgotten. Updae: More on the Senate filibuster, including Huey's legendary performance, here. On the Elections: From "Iraq the Model"
Hands Off Those 80-Year-Old Adventists? She Comes From a Suburb of Where? Listening to Dr. Dobson: What a Concept! And it Must Be . . .
Bush Lukewarm on Gay Marriage Amendment? Murder of Copts an Ominous Harbinger? Hey, Vonnegut, Where Are the Sirens? Did Noah Come From Arcadia? What If They Had to Read the Bills, Too?